There are many untraditional couples out there who would never dream of having a typical wedding complete with the white dress, tuxedo, pastel bridesmaids and flashy diamonds. Having been one of these brides myself, I'm happy to see a unique wedding band alternative that truly binds the bride and groom together. I did opt for a more traditional wedding band and engagement ring to go along with my chocolate brown, whimsical, fall-themed wedding dress when I got married, for those who are curious. So while these unique wedding bands may not be to my specific taste, I fully advocate any wedding fashions that break the mold of tradition. 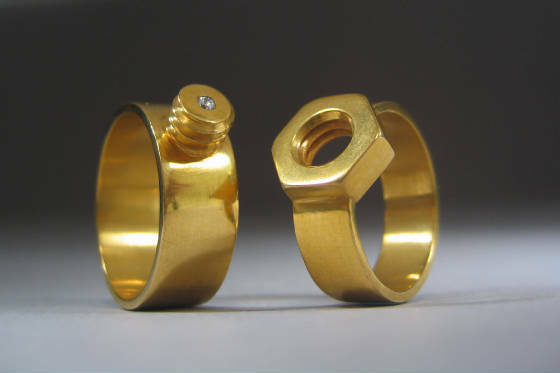 The Nut & Bolt Wedding Rings can literally bind bride and groom together for all eternity, and also open the floodgates for a slew of dirty jokes. The Nut & Bolt wedding bands may be untraditional wedding fashion, but they are a solid 24 karat gold which just might outlast the marriage, but could certainly come in handy if you find yourself short on hardware during your newlywed renovations.